Keeping your gutters clean is essential to maintaining the integrity of your home’s structure and foundation. It can also be an exercise in frustration, as gutters tend to clog easily with debris, allowing water to back up and overflow. The best way to ensure that you enjoy a leaf free, clog free system is with K-Guard. When installing anything on the exterior of your home, you want to have confidence that it will be durable enough to hold up under all kinds of weather conditions and temperature changes. K-Guard provides strength and durability that are unmatched by any other leaf free gutter system on the market today. It is crafted out of heavy duty aluminum that won’t corrode. The hangers that the system is built around are made out of all-weather polymers. When installed, they are placed every 24 inches, supporting the hood, and ensuring that the gutter won’t sag or lose its form. You can expect to have your K-Guard system in place and working well for many years to come, as the lifespan is almost unlimited. 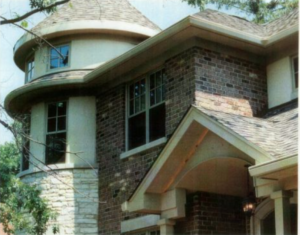 The gutter and the hood are coated with a durable material that can last more than 20 years, even in inclement weather conditions. Rain, snow, wind, cold, and heat are no match for the leaf-free gutter system. The K-Guard gutters are 5 inches wide, which allows them to drain far more water than other systems. Most other gutter protection systems on the market today are made for 3 and 4 inch gutters. Any debris that does get caught up in the gutter will flush right out, since the system works just as well with 3×4 inch downspouts. While it may seem like a minor detail, the appearance of your gutters does have an impact on the overall look and curb appeal of your home. K-Guard offers a smooth face, so it almost resembles crown molding. The gutter and the hood are the same color and made out of the same material, so they match perfectly. You don’t have to worry about the system sticking out and looking ugly or out of place along the roof line. It’s the most effective, attractive clog free gutter solution.